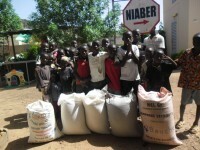 The Orphelinat Niaber was founded in 1993 by Mali Sangho. The orphanage is located in a village outside of Bamako, Mali, West Africa. Madame Sangho started her foundation to care for infants and children who were being abandoned on the streets and in hospitals. She has helped many children grow up to live healthy, happy lives. Bibi, as she is affectionately known by many, also helps the villagers that surround her orphanage by creating jobs for them. The orphanage currently houses 13 infants and 6 toddlers and has a satelite site at a remote village that was built to care for a blind woman. Bibi found this young blind woman when she was only 11 years old and living on the streets of Bamako. Amako is now 19 years old and has a home for life at the Orphelinat Niaber. In June 2012 Bridging Humanity spent time teaching their team how to harvest rain water, grow a perma culture garden and make useful items out of trash. We also introduced the founder of the orphanage to various global non profits with local offices located in Bamako, Mali. Thank you Bibi and team Orphelinat Niaber for having such a big, caring heart! We love you and the kids! Hello Tina. My name is Antonio and I’m from Spanish (Madrid). I will like to contact to you because my wife and me are in a process of adoption in Mali and our son appears in your video and several photos. Please, could you contact me? I will be very grateful with you. Thank very much. Yours gratefully. Antonio, I was touched to receive your comment. And yes, I would be very happy to share any information I have concerning your son. Please feel free to email me directly. Kind regards and much respect, Tina Cornely.